A great value in Veterinary Laser Therapy (LLLT). Grady Medical Systems offers class 3b and class 4 cold laser packages. We offer laser therapy at great pricing, with a three year warranty, excellent staff training, and a comprehensive marketing package. 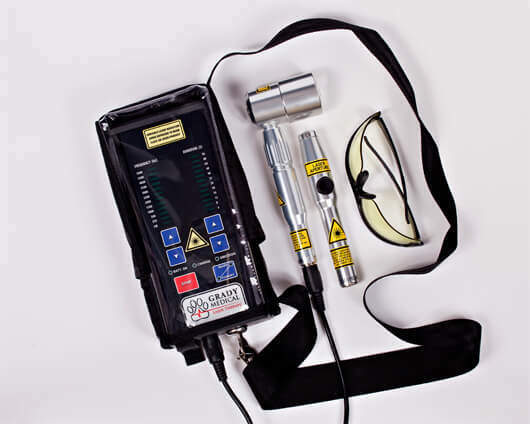 The Grady Laser is durable, effective and easy to use. It is highly portable, making it an ideal system for in clinic use and mobile use alike. The Grady Laser will provide your clinic with efficient treatments (typically between 1-10 minutes). Our veterinary laser therapy machine is very safe and we offer unlimited training to your staff so that anyone who will be hands on with the laser will be properly trained and ready to administer a variety of veterinary laser therapy treatments. Take advantage of our free trial offer to see what laser therapy can do in your practice. 1. We ship you the Grady Laser free of charge with marketing, educational materials, and accessories (listed below). 2. Once the laser is in transit, a Grady team member will contact you to set up a training time. 3. You will then have three weeks to use the laser in your clinic. 4. Our team here at Grady is available should you have any questions or should your staff need additional training. 5. At the end of the trial you can choose to purchase the Grady therapy laser (financing is available) or to return it. Should you choose to return the laser, Grady will email you a shipping label so that there is no cost to you. Current financing is available as low as $250/month. Credit approval is guaranteed for veterinary practices. Zero cost, zero obligation. Sign up now. After submitting this form, we will contact you to confirm shipping information for your trial laser. Thank you for allowing us the opportunity to help you explore laser therapy for your practice. The GradyVet P-3000 control unit is compatible with a variety of Class 3b probes to fit your needs. The standard probes included with our free trial are the Cluster Probe to cover large areas of tissue and the Precision Probe for hard to reach areas. See below for Class 3b probe specifications and description. Quaternary: Vasodilation increases perfusion, facilitating improved oxygenation and recruitment of macrophages, neutrophils and lymphocytes to areas undergoing repair and/or infection as well as further re-vascularization and proliferation of cells to aid healing. Improved perfusion will also facilitate clearance of inflammatory cells, fluids and debris (i.e. lymphatic drainage) more efficiently. Mechanisms of Low Level Light Therapy. See what other doctors are saying about The Grady Laser.